Home Biafra Featured Nigeria ELECTION BOYCOTT, A TOOL TO ERODE LEGITIMACY. THE CONSTITUTIONAL IMPLICATION TOWARDS 2019 GENERAL ELECTION. ELECTION BOYCOTT, A TOOL TO ERODE LEGITIMACY. THE CONSTITUTIONAL IMPLICATION TOWARDS 2019 GENERAL ELECTION. "Election boycott is a deliberate abstinence from voting. It is a form of civil disobedience, a protest where voters feel the electoral process is likely fraud, or that the electoral system is biased against its candidate, region or group; that the polity organizing the election lacks legitimacy or that the candidates running are very unpopular." It is done to show or express outright rejection, an expression of grievance for perceived wrong policy or government. It shows that the boycotting group is not part of the process, that it does not support nor contribute to the outcome of the process. The prevalence of the above situations for boycott is obvious in Nigeria. Since after the genocide of Biafrans termed "civil war" there had rarely been transparent elections organized by the Nigerian Electoral Body (INEC) in Nigeria and Biafra territory. It is always punctuated with rigging, ballot snatching, vote buying, underage voting, biased nature of the electoral system, falsification of the election result and other electoral frauds made possible by the occupational Nigerian government to continue denying Biafrans their right to good governance. It is very clear that voting in Nigeria is a mere waste of time as the electoral body in charge of the whole process (INEC), goes on to legitimize the outcome of the fraudulent electoral process not minding irregularities surrounding them. These and many more injustices in the electoral process, government policies, constitution and arms of the Nigeria government are why the Indigenous People of Biafra (IPOB) and the people of Biafra in whole who have suffered the tyrannical government of Nigeria for over 50 years now have decided before now starting from Anambra governorship election to boycott all elections in the country till date, until referendum is given by the Nigerian occupational government to Biafrans decide whether or not to continue with the system. Recently, PDP a political party in Nigeria made a shocking revelation threatening to boycott 2019 general election vindicating IPOB. This is incumbent upon the glaring rigging and usurp of power in just concluded Ekiti gubernatorial election. But there's been mixed feelings from various pundits regarding election boycott. Some argued that election boycott cannot be a solution to the problem of Nigeria given that the ruling party with its power and money, and several quirky statutes in the constitution securing their power, have the desk stacked in its favour. Therefore, boycotting election will give the ruling party accelerated victory and detach boycotting group, party or region from organs of power leaving them susceptible to been irrelevant. While other pundits, political corrects and proponents of the continuity of the current status quo are of opinion that PVC is the answer. This crop of people may be unaware that vote does not count in Nigeria rather, after election comes selection. The ruling class ensures that they hold sway the will of the electorates, making sure they don't leave any trace of controversy arising from the rig conspiracy noticeable to the public. The electorates become objects of ridicule and treated inhumanly. The two proponents (pundits mentioned earlier) failed to come up with workable solution to the problem but defiantly maintained that boycott cannot be solution and cannot guarantee referendum as it's not enshrined in the constitution of the country. It's worth noting that election boycott has been employed by so many civilized countries of the world outcome of which has helped in addressing perceived wrongs. Slovakia 1997, Czech 2003, Brexit referenda are just a few of them. It is also worth noting that even as referendum is not in the constitution of Nigeria. In 1963 Nigeria had its first referendum/plebiscite to create a new region. It also had another one on Bakkasi whether to cede it to Cameron or remain in Nigeria. The inevitability of boycotting the 2019 general election is becoming more glaring with APC led government support for intimidation and harassment of opposing parties and individuals and its unruly characteristics to stack the desk to its favour. With the situations on ground there are high indications that a large population of people (Nigerians) will join Biafrans to boycott the elections (state and federal) thereby creating a vacuum at the Presidential and Governorship level. (b) he has not less than one-quarter of the votes cast at the election in each of at least two-thirds of all the States in the Federation and the Federal Capital Territory, Abuja. Same applies to the governors and others. When this aforementioned requirement is made impossible to achieve due to total boycott from Biafrans and other aggrieved Nigerians, the National Assembly extends the tenure of the incumbent government by a maximum of 6 months while it makes fresh nomination or finds a lasting solution by calling for a conference to renegotiate the unity of the country whereby Biafrans will bare their mind on their unwillingness to continue in the unworkable unity with Nigeria. This will spark debate in the Parliament to allow for referendum. To Biafrans election boycott is a tool to make illegitimate the rule of the occupational government of Nigeria over Biafrans, since legitimacy is only achievable when the people agree. To make it clear Biafrans only need and trust the government of Biafra to henceforth oversea their affairs (social and political) in democratical setting. The reason Biafra ought to be made independent is to carter for the needs of Biafrans. Since Biafra sovereignty and independence is still recognize by some countries of the world though she is been forcefully ruled over by the occupational government of Nigeria for over 50 years, a referendum would help to either make legitimate or illegitimate this forceful rule which means Biafrans will decide to stay as slaves in Nigeria or to uphold the sovereignty and independence of Biafra and live as free citizens in Biafra. 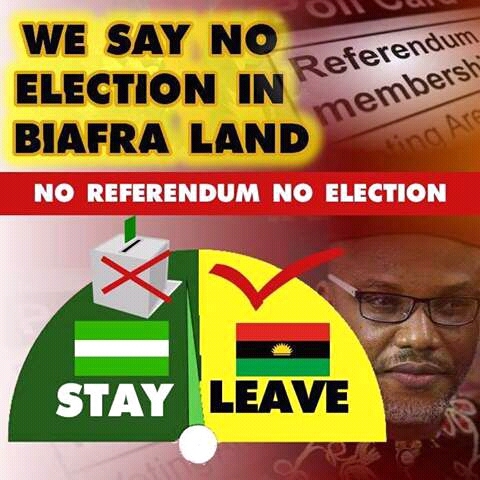 Where referendum is not allowed before the Nigeria 2019 elections, and boycotting the elections that legitimize the occupational government of Nigeria rule over Biafrans for another 4 years, is obeyed and achieved by Biafrans with concrete evidence and proofs (videos, pictures etc.) attesting to it. The next line of actions can be activated to forcefully free a sovereign nation Biafra held hostage with her citizens (Biafrans). Boycott as a tool of Civil Disobedience is more than powerful and democratical to set us free. It is your right, use it! I will use the right henceforth by boycotting any process that legitimize the rule over me by the occupational government of Nigeria.